Residents of Johnstone Castle are looking to the future now that demolition work has started to clear the way for 95 new build Council properties. The development will feature a mix of mainly two and three bedroom homes and own-door flats, as well as two specially designed bungalows for tenants with mobility requirements. The regeneration project has also catered for larger families, with four semi detached homes which have four bedrooms. The next phase of work will see vacant properties at Cedar Avenue, Tower Road and Elm Drive taken down to make way for the new energy efficient homes. 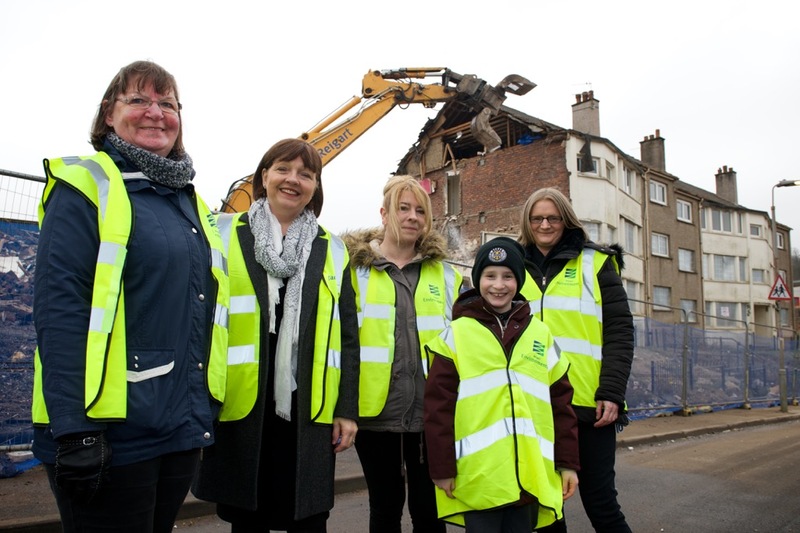 As excavators from Reigart Contracts Limited moved in to start the demolition of the flats at Elm Drive, built in 1960, residents including Nicola Stevenson gathered to watch. Resident Margaret MacKay was also on hand to watch the next phase of the regeneration take place. She lived in number 89 for more than half a century after first moving in as a six-year-old school girl in July 1960. The 64-year-old said: “When we moved in it was so new there wasn’t even a pavement here. Construction work on the new housing is expected to start next month by the Council’s recommended contractor ENGIE Regeneration Limited, with the first completions due next spring. The construction costs of almost £13million will be funded from the Council’s housing investment programme and a Scottish Government grant. Council Officers are also on hand in Johnstone Castle Community Centre on Tuesday, Wednesday and Thursday mornings if tenants or residents have any questions about the ongoing regeneration work in the area. Tenants who moved out of the flats to allow the regeneration work to go ahead and who wish to be considered for one of the new build homes, can contact Council staff at the Housing Options team in Johnstone on 0141 618 2581.